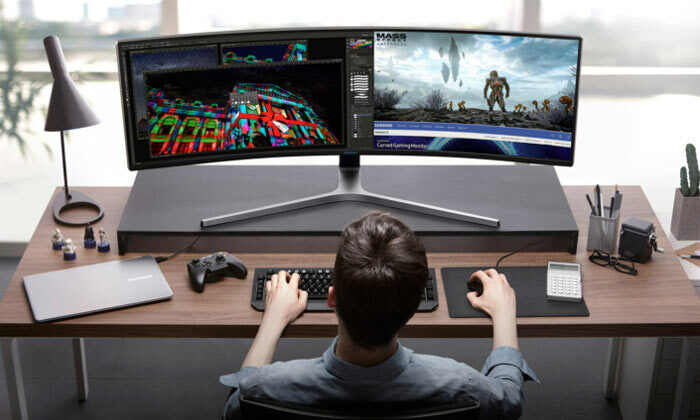 Just ahead of the weekend Samsung introduced the industry's first HDR QLED Gaming Monitors. That's not all, these monitors are also the first to support AMD FreeSync 2, providing refresh rates up to 144Hz on their 1ms VA 1800R curved display panels. There were three models introduced in all; the expansive 49-inch C49GH90, and the C27GH70 and C32GH70 with 27- and 32-inch diagonals respectively. Samsung boldly refers to these new products as representing "the future of gaming". One of the key enabling technologies behind the new screens is QLED quantum dot technology. Thanks to these QLEDs, the screens can support both approximately 125 per cent of the sRGB colour spectrum and 95 per cent of the DCI-P3 motion picture standard. Furthermore, all the monitors support refresh rates up to 144Hz, and AMD FreeSync 2 which facilitates stutter-free and tear-free HDR gaming. 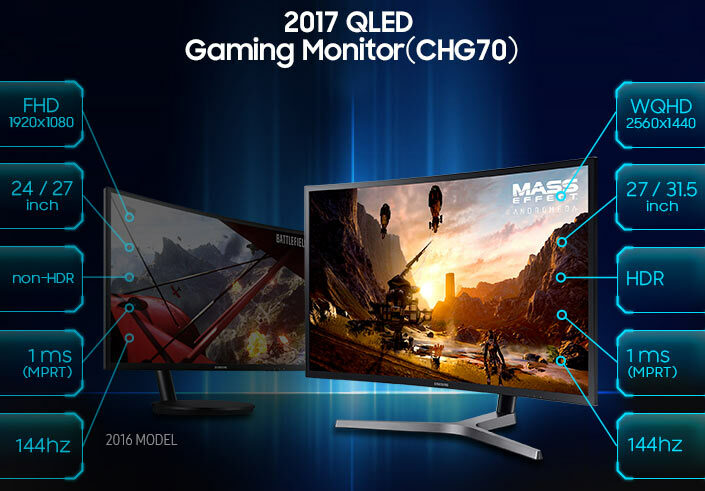 For green-team GPU users, the new monitors received HDR compatibility validation with Nvidia's graphics cards. 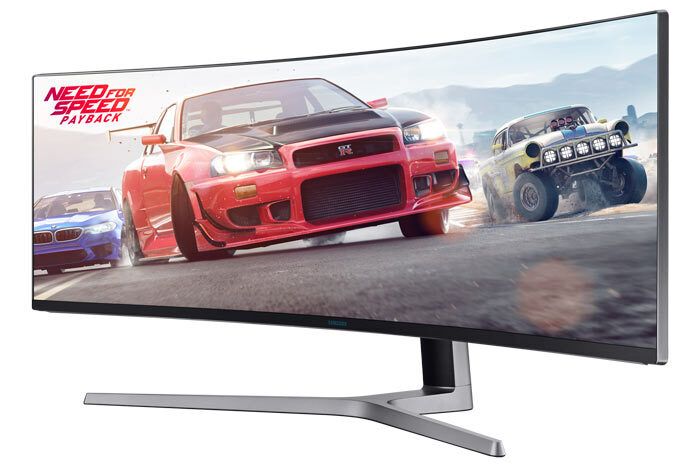 The biggest monitor here, the 49-inch C49GH90 offers a resolution of 3840x1080 (32:9 aspect ratio) that's equivalent to a pair of regular 1080p monitors next to each other sans-centre bezel. Meanwhile the pair of CHG70 displays provide 2560 x 1440 pixels. 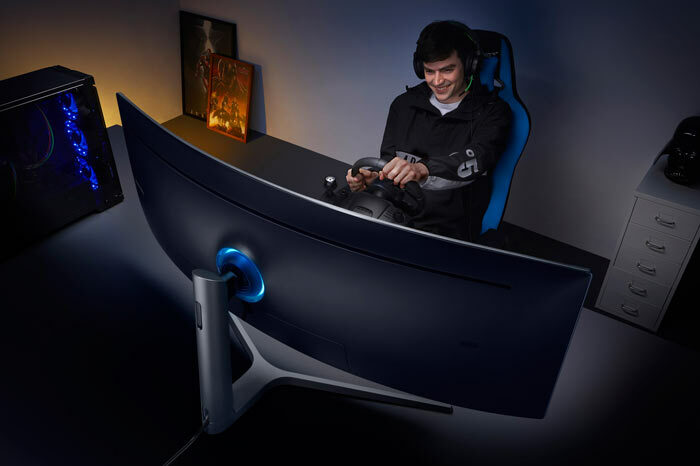 All of the monitors include a USB 3.0 Hub, adjustable stand, game modes, eye saver and flicker free modes. Samsung says it has worked closely not only with AMD but also with the likes of EA/DICE and Ghost Games. FreeSync 2 enhanced games with HDR visuals are thus on the way in the form of Star Wars Battlefront II, and Need for Speed. Samsung didn't provide details of availability or pricing but expect a premium price on these with the plethora of advanced technologies on offer. What are the actual dimensions of the 49“ one? I'm interested, but is it like 2x 27” monitors side by side, or what? SEPARATION OF NEEDS AND WANTS IN PROGRESS. Please wait. Now we just need a FreeSync compatible GPU capable of pushing all those pixels at those frame rates. Hint, hint, AMD.